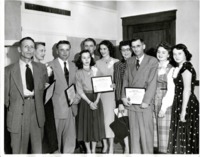 Soil Conservation Award Winners, Annual meeting in February 1962. 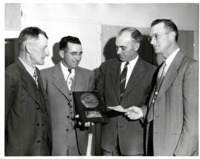 Winners L to R: Hans Sothman, Otto Schwartz, and Alfred Hogan. 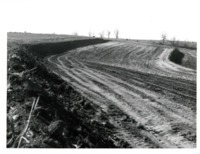 Photo of a completed example of parallel terracing. 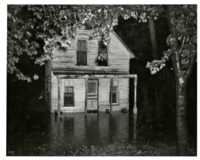 Max Kern's home in south Anita, Iowa during the Turkey Creek Flood. 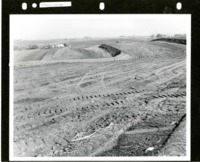 Stages of construction of a Grass Waterway on Maurice Odem's Farm. 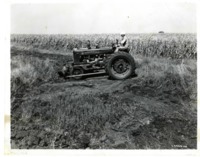 It was prepared with the farm tractor dozer and plow. 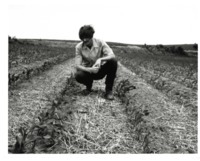 A man inspects crops on a Cass County farm field. 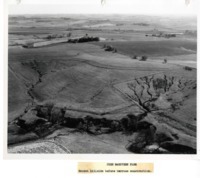 Photo of John McGovern's farmland in Atlantic, Iowa where there is visible eroding before terrace construction. 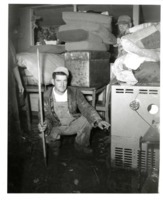 Home in Anita during the Turkey Creek Flood.